General Winter targets Sinn Féin's propaganda machine and their finances, while Jimmy puts pressure on Ursula to feed him information. General Winter suspects Lily of being a spy, and Ursula must try to help her without implicating herself. Robbie plans to kill Eithne, but is stopped by an unexpected opportunity. Jimmy breaks Joey out of prison, and helps Ursula to be reunited with her son. Eithne's outrage at Diarmuid's death is ignored, and Maurice faces an impossible choice. This epic tale features an ensemble cast comprising of some of Ireland's finest young actors - watch them discuss their Resistance characters below. I loved Rebellion & this sequel is even better! Jimmy Mahon is back and this time, 4 years after the Rising, life is grittier. Brilliant cast, with the exception of Ben Smith who lacks emotion and every line seems to be an effort. Some artistic licence, but this doesn't matter as you are really given a sense of what people went through in the fight for independence of Ireland. 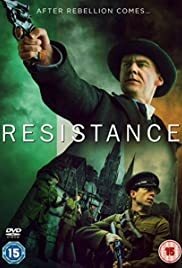 I wish this would be shown on the BBC so us British can see how terribly we treated Ireland and continue to do so (BREXIT) Brian Gleeson, Simone Kirby, Paul Ritter & Aoife Duffin are absolutely superb and really help bring history to life.